2012 is just around the corner and from the first week in January for the coming year the City of Boroondara Library Service will be taking part in a Flickr group challenge called Friday Photos 2012. Each Saturday we will be given a theme for the following week and can post up to three photographs on that theme in the Flickr group by the following Friday. We will then be using the opportunity to write about those photographs in two of the library blogs, this one Telling Tales and our reading blog, Bookends. The theme for the first week has just been announced and it is, perhaps not unsurprisingly, "Beginnings". There are all sorts of possibilities with that theme for local and family history, so watch out for what we come up with! 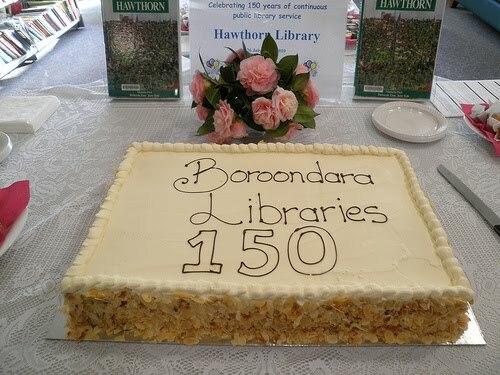 In the mean time you might not be aware that the City of Boroondara Library Service has a Flickr account where you can look at photographs relating to the libraries currently. Check in here and see what you can find. Remember our historical photographs can be found on the web via the library catalogue, via Picture Australia or via Trove.